I have been awfully out of touch with all things literary, even the latest Robert Galbraith aka JK Rowling release whizzed past my notice. Anyway, here is a long overdue book review. I stumbled upon this book at my new library (best birthday gift ever, by the way.) The Coral Thief by Rebecca Stott is an odd book, but one that is right up my alley. Setting: Paris, July 1815, Wellington has defeated Napoleon at Waterloo. Daniel Connor is a young Englishman, a medical student on his way to Paris to study anatomy under the guidance of Georges Cuvier. He carries with him rare corals and important documents. On the train he meets a strange woman. Lucienne is a follower of Jean-Baptiste Lamarck, with shocking views on evolution and species. The next morning, Connor wakes up to find Lucienne gone and his precious specimens missing. In Paris, he enlists the help of Inspector Jagot, a fiendish ex-thief, who convinces Connor to stay away from the dangerous woman. But Lucienne reaches out to Connor himself, with a proposition, that he help her in return for the stolen possessions. Soon Connor finds himself caught up in an uncanny jewel heist and an even stranger tangle of revolutionary ideas and political upheavals. 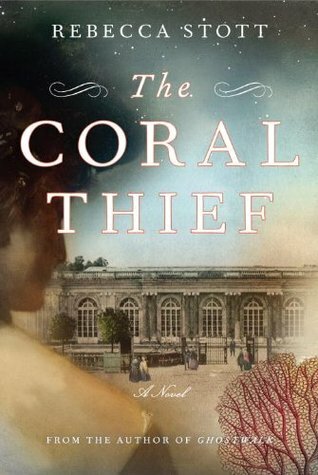 The Coral Thief is not without its flaws - a naive guileless narrator, characters who aren't active agents but simply let the story happen to them, frequent purple prose. But they cease to matter in the light of Stott's meticulous research and attention to historical detail. A romantic thriller, a scientific mystery, categorize it however you may, this book is an ode to an atmosphere abuzz with change and discovery, and the tumultuous history of Paris. Deeply woven into the consciousness of its time, the story has a "slice of history" feel. The Coral Thief begins with a quote by Charles Darwin from his voyage of the Beagle. An obvious choice for a book that explores the fresh sprouts of a young theory of evolution. Even as Professor Cuvier disregards the doubters, Connor is drawn to the study of molluscs and tiny organisms and the possibility of an alternate version to his Biblical truth. I had overheard fragments of conversation about transformism in the coffeehouses and taverns of Edinburgh, where the medical students talked politics. But Erasmus Darwin was mostly ridiculed by the students in Edinburgh; there was a whole set of jokes about whether we had descended from cabbages or oysters. (...) But Fin's friends talked openly about transformism, and rationally, not speculatively, or apologetically, but as if the hypothesis were beyond question. They - the heretics and infidels - now fascinated me. The atmosphere is charged with radical new beliefs and questions and Stott has captured this energy on paper. The politics of Lamarck's theory of species transformation, the "dethroning" of man as one of the characters aptly puts it, its interpretation as a shift of power from the royals to the masses, is most intriguing. The book makes it plenty clear that politics was of no interest to Lamarck, whose curiosity only rested in science. But a thought cannot be contained in a bubble, and The Coral Thief shows us this and other waves of consequence that stirred the sentiments of the Parisians. The book neither criticizes nor picks sides and Connor's perspective of an alarmed outsider works rather well, as you are led through glimpses of the reign of terror, of Bastille and finally Napoleon's abdication, the resilience of a city swarmed with foreign troupes, a shocked city that still whispers of Napoleon's return. Stott's lyrical writing amplifies the drama, certainly, but it is not maudlin. Connor's story is interspersed with fleeting moments from Napoleon's point of view that in my view it could have done without. Without giving away the plot, I must add, the mystery itself is not entirely stable in its construction either. But these are minor grievances in a magical whole. If you are a stickler for well researched stories and like history, all things French, thought provoking fiction (not a good old carefree airport read) and don't mind the occasional clumsy narrator, do pick up The Coral Thief by Rebecca Stott. It sounds as if there is a lot to this book. It sounds very good. I found you comment about the characters just letting things happen to them interesting. I think that this sometimes reflects real life. Yes, Brian, you're right about that. Viktoria, really? I don't know why. My library copy actually had a different cover which I couldn't find online - and I returned it without taking a picture. But I admit I like this one more! That's a great review. I remember starting on this book but didn't go past the first few pages. For some reason I thought the encounter between Daniel and the mysterious woman took place in a carriage. I was so convinced of that. This sounds a bit too political for my taste but maybe I'll give it another try at some point. You're welcome, Jess. I hope you read the book! "Paris, 1815. Napoleon has just surrendered at Waterloo and is on his way to the island of St. Helena to begin his exile. Meanwhile, Daniel Connor, a young medical student from Edinburgh, has just arrived in Paris to study anatomy at the Jardin des Plantes—only to realize that his letters of introduction and a gift of precious coral specimens, on which his tenure with the legendary Dr. Cuvier depends, have been stolen by the beautiful woman with whom he shared a stagecoach." Delia, oh I get it! I would have checked it too... You know, I see this as a consequence of reading about things that don't belong to my world, and that I don't focus quite as much on the detail. A train carriage is probably what I pictured in my head as I read those pages!